What an amazing aroma this wine possesses! It’s full of peppery spice and crushed raspberries and it’s alive and exciting. The flavors are as compelling, showing off a concentrated fruitiness balanced by peppery tartness and the most beguiling silky texture. The experiment we began in 2011 with the straight Syrah continues with this offering, a blend of Syrah 70% and Grenache 30%, from the new John Sebastiano Vineyard located on the eastern edge of the cool Santa Rita Hills appellation of Santa Barbara County. The vineyard being so promising, Adam could not take the decision to blend all the components together. This is why in 2011 he ended up creating 5 different bottlings from Sebastiano and all are different expressions of single varietals, blends, sections, and picks made from that one vintage. 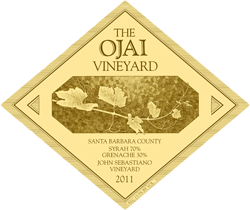 It could be confusing to the markets and consumers if it wasn’t for the fact that this is what sets The Ojai Vineyard apart. The desire to create, to explore, unencumbered by business or marketing decisions. Here the site and vintage voice is dominant. When each lot is singing a different tune the desire is to find out how many harmonies are possible. This particular composition is rich and weighty with the syrah lending bass notes and a dizzying array of spicy, balsamic, earthy tones. The Grenache is more of a soloist with its spiky raspberry perfumes and fine grained, lengthy tannins. It took this wine a few more month than others to come together and is now starting what will be a long life of constant aromatic evolution. A tasting room favorite, this wine is simply delicious!